Practice writing upper-case and lower-case B by tracing the dotted lines. 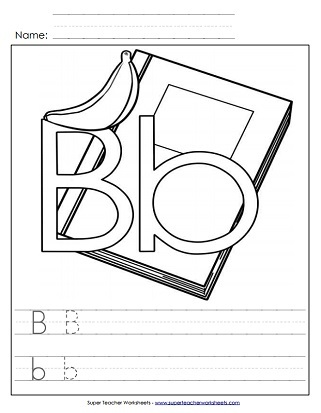 Then students can color in the large letter B b, the book, and the banana. 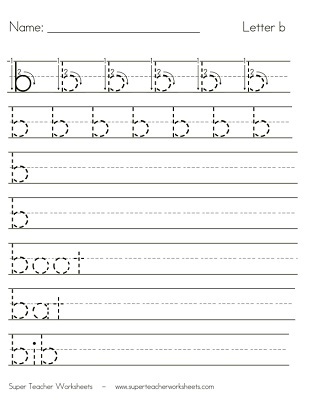 Practice writing upper and lower-case B b by tracing on the dotted lines. Then color in the pictures of the banana, bird, and beaver before then creating a fun hat to wear. Trace the dotted lines on this worksheet to practice writing lower-case b. This is another lower-case letter b worksheet to practice handwriting on by tracing the gray lines. Practice writing capital letter B by tracing the dotted lines. Another upper-case letter B handwriting worksheet. Students can trace the gray lines to practice their writing. Practice writing and learn to recognize the letter B b. Students will love using an ink dauber to dot circles in the shape of the letter B.